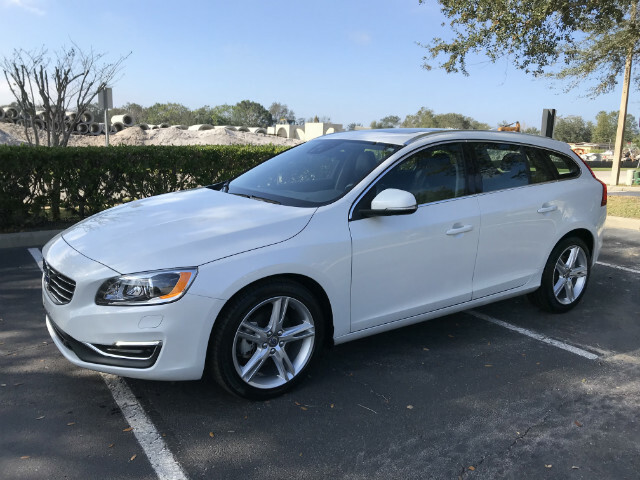 2017 Volvo V60 T5 Platinum Sport Wagon. 18k One Owner Miles. Pearl White with Black Leather Interior. Loaded with options including: Navigation, Sunroof, Front and Rear Heated Seats, Keyless Entry and Start, Harman Kardon Sound System with Bluetooth and Satellite Radio, Wood Grain Trim, 18" Alloy Wheels with Pirelli All Season Tires, Xenon Headlights, LED Running Lights, Blind Spot Assist, Lane Departure Warning, Adaptive Cruise Control and Much More. Remainder of the 4 year 50k Mile Factory Warranty through Volvo. All Original with No Accidents or Paint Work. No Smoker Previous Owner. Both Keys, Owners Manuals, and Floor Mats Included. Over $41k Brand New. Call Cliff for more details @ 321-436-9523.